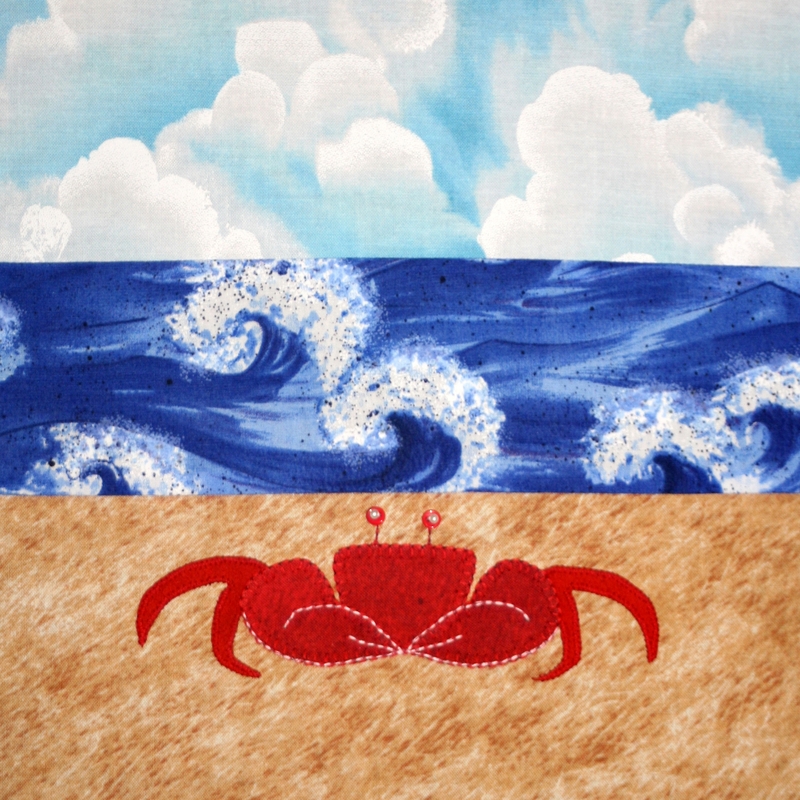 Refer to below photos of crab before starting this technique. Photo on the left shows the pattern below the pressing sheet. Photo to the right is finished block. Instructions and steps to take when tracing pattern piece onto SAS, cutting, and fusing to BG block: Place pattern onto light box or window, right side down. When tracing pattern pieces onto SAS, be sure to allow at least 1/8” extra space around every edge. Cut out pattern pieces with 1/8” extra space on the outside edge, fuse SAS to back side of fabric, cut on the pencil traced edge. Place paper pattern (right side up) onto ironing board. Lay appliqué sheet over paper pattern and arrange fabric pieces, using the pattern as your guide. Arrange pattern pieces from the back and work your way forward. When they are all in place—put a piece of muslin on top to avoid getting sticky adhesive on your iron, and press well with a hot iron (following SAS manufacture directions). Allow to cool before removing from appliqué sheet. Your pattern is now fused into one piece of fabric. 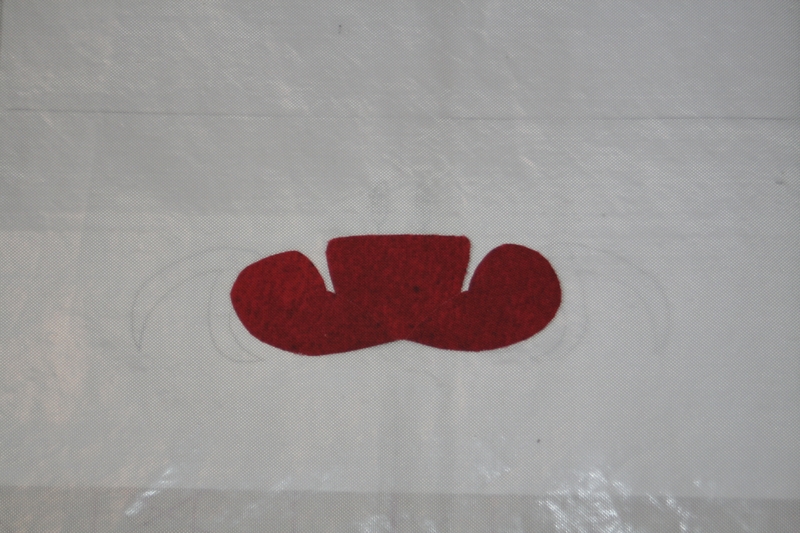 Peel off of the appliqué sheet, center onto BG block and fuse according to manufacturer’s instructions. When using 100% cotton, you may machine buttonhole stitch or machine satin stitch edges of appliquéd blocks using complimentary or contrasting threads as desired. When using wool, hand-stitch using 1 strand of DMC embroidery floss. I prefer that my floss be the same color as the wool that I will be stitching onto. I start by using a simple whip stitch to sew the wool pieces onto the background block. Bring your needle up on the outside edge of wool that will be stitched, then go toward the inside of the figure that you are stitching 1/8″ and put your needle down through all layers of wool. My stitch is 1/8″ wide and 1/8″ apart. I hope the detailed instructions for this technique will be helpful.